Wednesday is Recipe Day at Cooking Manager. Today’s recipe comes from Kosher by Design for Teens and 20-Somethings, by Suzie Fishbein. Go here for more information and to win a free copy: Deadline October 31, 2010. Cover 2 cookie sheets with parchment paper. Set aside. In a large bowl, whisk the flour, sugar, baking powder, and salt. Cut the butter into small cubes. Add it to the flour mixture and use both hands to knead the dough, rubbing the butter into the flour. Add the eggs and milk, kneading to form a crumbly but somewhat sticky dough. Turn the dough out onto your work surface and knead for another minute or two; the dough should start to become more smooth as the butter softens from the warmth of your hands. Divide the dough into two pieces. Use the heel of your palm to spread each piece into a circle, about 3/4-1 inch thick. If adding any mix-ins, spread them over the circle, then knead and re-roll and press into a circle. 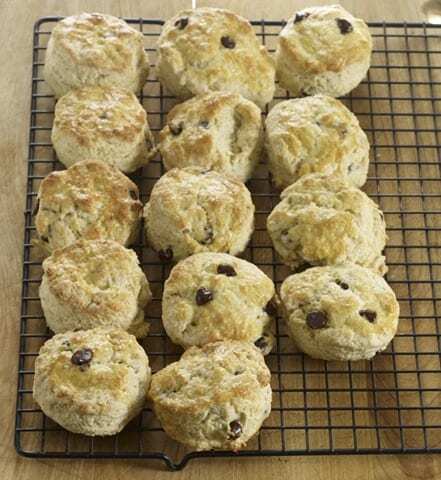 Do not over-mix the scones. Using the open end of a drinking glass or a round 2-inch diameter cookie cutter, cut out circles of the dough and place 2 inches apart on the prepared cookie sheets. Re-roll the scraps, and cut out more scones. With a fork, whisk the remaining egg. Brush generously over the tops of the scones. Bake for 15 minutes or until bottoms are golden brown and tops are light golden. there are so many recipes with wine! I don’t use wine and don’t have at even at home. How can I replace it? Marina, try orange juice for this one. Thank you for posting this. That picture from your previous posting on that book looked so good. I love scones. This is putting me in the mood for a tea party. I was going to ask what you think of using whole wheat flour, but with over a stick of butter, what’s the point? Any way to sub oil for the butter? I just made buttermilk biscuits that called for oil and they came out great. Abbi, I’m really not sure. I think it would make the dough too runny.